I just got back from a wonderful trip to Provence, France thru Aroma-Tours. Besides being enchanted by the lovely Robbi Zeck and Jim Llewelyn, I met many French cats and dogs while on this adventure. And there seems to be a commonality among them! The French animals are somewhat aloof. Wa s it my American accent? (I spoke French to them because I wanted to meet them properly and have them understand me) Or maybe my political views? I just could not figure it out. Normally, when I approach an animal here in the States, I get a predictable response. Wagging, happy whining, wiggling, headbutting, etc. The French response was much more sedate and sophisticated. More je ne said quoi… aloof. Call me crazy. But I felt comfortable enough within the group that I was travelling, so I mentioned my observations. Others had noticed this, too! It was somewhat reassuring that this particular dynamic wasn't just my imagination. But then my thoughts were interrupted by a Frenchman's outburst, "Ah! They just know their place!" To which I replied internally, "Ah! You mean, in my heart? Or on my lap?!?!" 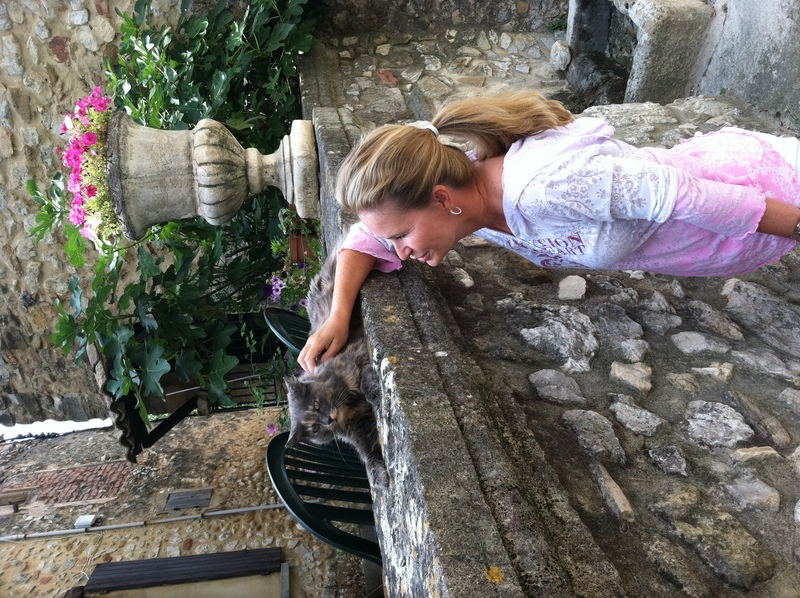 Here is a photo of a beautiful French cat in Gigondas who actually seemed to enjoy my attention and pets. This beauty had a friend who finally emerged from the hibiscus bush to the right, but would not consider letting me get near. Who knows what he/she was thinking. Again, maybe they just don't like American tourists. Or maybe it was my sense of style (yes, I was wearing tennis shoes in France). Whatever the case, I'd love to know if anyone else has observed this particular phenomenon with the French animals.